After 10 seasons of doing more with less as the Greely High football coach, David Higgins announced his resignation Monday. Higgins, 62, had an overall record of 51-43. This season the Rangers went 5-5 in the competitive Class B South with only 22 players. Greely qualified for the playoffs for the eighth consecutive season and won a first-round playoff game for the fourth straight year. “I did it officially today, but this year has been really hard for me on so many fronts and I know it’s going to be a huge amount of work going forward, and I own a business that has to take priority,” Higgins said. Greely graduates 10 seniors – eight who started both ways – and does not expect more than a few eighth-graders to join the high school program. The Greely football community is exploring options for 2019, including forming a co-operative arrangement with another school or applying to be part of a new eight-man league expected to be approved by the Maine Principals’ Association. Under Higgins, Greely became known as a hard-hitting, fundamentally sound team that improved as the season wore on. When the Rangers beat Biddeford in this year’s regional quarterfinal, it was the third time in four seasons they avenged a regular-season loss in the playoffs. Greely Athletic Director David Shapiro has identified Falmouth and Yarmouth as potential co-op partners. Fitzsimmons said he has not had any direct conversations about Greely’s remaining players joining his program. Higgins recently was named the Campbell Conference Coach of the Year, and assistant Jamal Chatman was named the league’s Assistant Coach of the Year. “He and his staff, I give them a ton of credit,” said Shapiro. A former player at the University of Maine, Higgins spent the 1980 season as an assistant coach at Cheverus High in Portland. 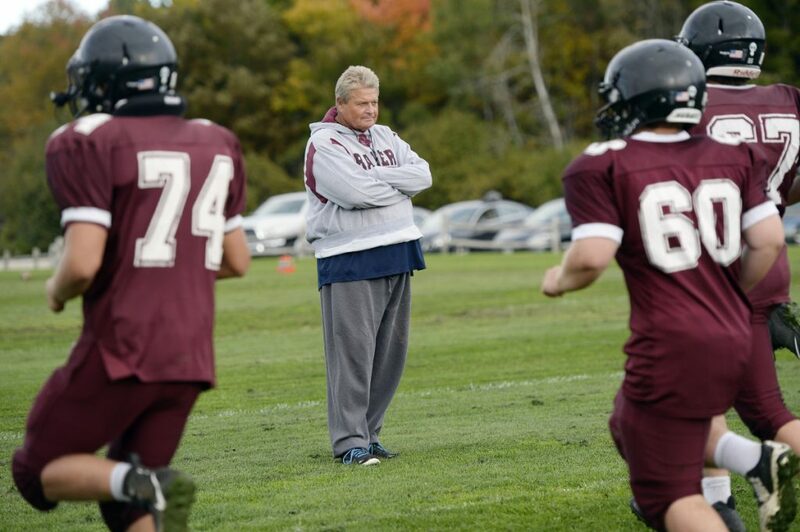 He didn’t coach again until his sons began playing in the fledgling Greely-Falmouth youth program. Overall, Higgins said he has been in the Greely football program for 25 years, including three as a high school assistant before taking over as the varsity coach in 2009. “Regardless of how many players we had, he still held all of our players accountable,” Shapiro said, “and what they learned from football far surpasses anything that they did on the field.